I have wanted to frame my rug of Alexander every since I finished it, but it was always too costly and I didn't know what I really wanted in terms of framing. I knew that I didn't want glass. It is a rug and rugs need to be felt as much as seen. Textures and fibers are about both senses. So I got the idea of putting the rug in a big shadow box with no glass. I took it down to Michael's when they were having 60% off sale, and it is a good thing because my gosh it was expensive. Was it worth it? Oh yes! The frame grounds the rug and gives a home so it isn't floating on my wall. It makes it feel important. Actually it commands the room now. Recently I took the plunge and joined a local art guild, the Kingwood Art Society. I decided to join when our hooking guild was extended an invitation to show some of our rugs as guests at the KAS fall art show. Since I wanted to be part of the actual art judging, the president Betsy Barry, recommended that I join the art guild and become a full-fledged member. So I did. 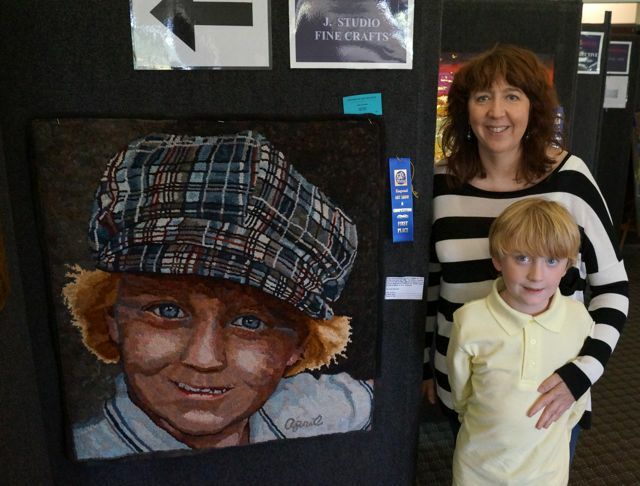 The artist guilds have terrific categories, so I was able to enter the professional level in Studio Fine Crafts, which is exactly what rug hooking is. Granted I have to compete with potters and jewelers, but the diversity makes it even more fun. Today was the judging and I am thrilled. My portrait of Alexander took First Place, my small rug Lady Red Jack took Third Place, and my mask Red Jack on Masquerade took Honorable Mention. All three pieces now go on to the state level and will compete in the Lone Star Art Guild Convention Competition that will be held in May. I am quickly posting this picture from my phone...so sorry for the less than good picture. I will post better pictures and stories about Sauder once I get home. We head back on the train tomorrow. This picture is a proud Alexander in front of his portrait exhibited at Sauder Village. It is a GREAT show. If you can get over to see it, it runs through Saturday. The featured exhibit of Magdalena Briner's rugs is FANTASTIC! I want to extend a huge thanks to Evelyn Lawrence and Kathy Wright for putting together the Briner exhibit. More on this later. But go and see it if you can. It alone is worth the price of entrance. I bound Alexander At Sauder with matching wool, in Canadian Show Binding format. And Wade and I just hung the mat in our dining room. It commands the space. Lovely. I started this on March 21st. So I was able to finish this piece in 2 months. That seems pretty fair given that it is a large piece. I finished hooking Alexander At Sauder. Now on to binding. 5. the more colors the better: I used 12 colors in this rug in all 8 values which means 76 different color intensities. There are 68 color intensities in the face alone. I have been experimenting with hooking different types of backgrounds for years. When I hooked Lady Sunset, I came up with a procedure that I love and have now used in the background to Alexander at Sauder. I take a number of different textures and overdye them with the same value of the same color. In this case I used Shades of Dusk 122. Then I hook all the different textures in randomly by pebbling. Pebbling is a technique I use when I purposefully do not hook in a straight row. The hooking meanders, although each consecutive loop touches the other. So there is no jumping around. I hook the next strip in next to it, continuing the meandering, until all the space is filled in. For the background on this rug, I used overdyed texture pack 122 in value 5 (lighter) on the right side of his head; texture pack 122 in value 8 (very dark) on the left side of his head. I love the look because it feels like the light and shadow is dancing behind him. I am packaging my texture packs for this purpose, so each texture palette pack contains 1/4 yard of different wools overdyed with the same value of dye. I can do this in any of my colors, in any value. If you are interested, go to the pull down menu SHOP FOR WOOL to view what is available. Been working away on Alexander's portrait. Finished the hair. Decided to pebble the hair rather than hook it in straight or curved rows. This seemed to work better with the rest of the mat and the way I pebbled the face. Went to work on the background. I'm using two batches of textured wool packs dyed with Shades of Dusk 122. One pack I dyed in value 5 (lighter) and the other in value 8 (very dark). I am using the lighter value on the left background and the darker value on the right. I am using about 8 different textures so that I get a lot of subtle differences in the background (none of which you can see in this picture because of poor lighting). I edited the picture. There was a wooden fence beam behind Alexander's head, but when I hooked it in, it detracted from his face. Since this mat is about his face, and not the fence, I tore out the fence and am rehooking the area in plain background. I am leaving his light colored shirt until last because I don't want to get dark wool dust all over it from the background hooking. So hurray! I finished the hat. Moved on to the side of the face with the ear and the hair. I am hooking the hair with Butterfield 122 (8-value pack and texture pack). It was very difficult to get the side of the face correct in terms of shadow and distinction. I rehooked the area about six times, and the hair twice. So I have been working on this small area of the rug all week. The good news is that I will take what a learned on this side of the face and apply it to the left. Maybe I won't have to rehook the left side so many times! We can only hope. Sorry for the inferior photo, but my camera ran out of battery. So I had to use my phone camera. Been doing a little dyeing, trying to keep up with the wool for the plaid hat. Here is a pretty stack of Alexander Blue 109 that just came out of the pot. I actually sat down over the Easter holiday and did some rug hooking. I made substantive progress on the hat, which I must say is a very overwhelming hat. Keep in mind that the rug is 3 feet by 3 feet, and this plaid hat is about 1/3 of the rug. That's a lot of plaid. So it amounts to constant back and forth reference between my visual and my mat and my box of wools in all their values. I resorted to screwing together a couple of wooden cartoons so that I have eight compartments to keep my values straight. That has helped, but it is still very slow hooking with so much back and forth referencing. But I think it is worth it. It is really starting to look like a hat now, and I can see the end of the tunnel, only a bit more of the top and brim to go. Sorry I haven't posted in a while, but the end of the semester is REALLY busy for me. I have been hooking here and there, but mostly I'm just too tired. I have finished the left side of the hat and want to move down to the brim and band next to see how this is going to sit on top of the head. I have run out of blue and gray wool so I need to find some time to dye. Alexander wanted his picture taken laying next to the rug face he has been watching me hook with excitement - enough excitement that he drew a small lion face on foundation today and started to hook the eyes. We will see if he stays with it. But hey it was a great compliment. He likes the rug I am hooking of him. Alexander at Sauder is progressing well. I have almost all of the face finished now, but thought I'd start posting pieces of it as the rug comes together. Here are his sweet lips that I love to kiss. I spent the day yesterday dyeing a color I need to continue hooking All in the Family (Pixie Green 154). Since I let my wools process overnight, this meant I had nothing to hook on in the meantime. So I took the afternoon while my pots were simmering to design and draw onto foundation my next project. Last summer while at Sauder, I took a picture of Alexander that I love. Since I have been wanting to try my hand at hooking a wide-cut portrait I decided to use this picture of him. After printing out the photo, I went across the street to Kinko's Fed Ex and enlarged it to 32" by 32". It took me four hours to get it drawn onto my transfer fabric and then transferred onto my foundation. But it was worth it. Here is a photo of the results. I can't wait to get started.